Tool is a band. I am a fan. That is how I got my name! I don't know much about power tools, sorry. 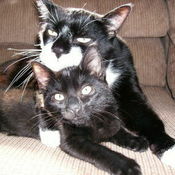 I love animals, and those are two of my cats in my profile picture. I also volunteer for the local no-kill cat shelter and a portion of my proceeds go to the shelter. I've recently started selling gift baskets, some of them I've added to my booth. If you need a gift basket or flowers for any occasion, just ask me, chances are I have something perfect for you. ToolGal462 doesn't have any items in their booth! A very nice person & seller! Would highly endorse. Easy to work with & honest. An all around great person! God bless you for your work with animals!